The challenge: how to distinguish a beautiful Provençal home to its potential guests in a global market? The answer: a mix of gorgeous images, inviting text and a sense of old-school service. Design: Warren Group | Studio Deluxe. 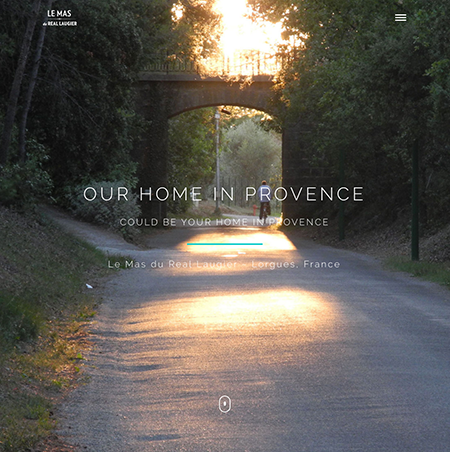 Experience the charms of Provence and the warmth of its people from your own home base. Our secluded, gated property in the village of Lorgues provides a serene retreat for your visit to this enchanting region. The private country house and gardens offer all the amenities for a tranquil and memorable holiday, and will easily accommodate 8 people, 10 if need be. Lorgues — a small, medieval village surrounded by wineries and olive trees — is nestled in the Provence-Alpes-Côte d'Azur region in southeastern France. "This is the Provençal heartland of old villages in summer dress, of huge blue skies, herb aromas and old chaps playing boules late into the evening," said an admiring travel writer for The Telegraph. Lorgues offers the visitor many pleasures. Colorful houses, from pastels to bright hues, line its narrow, winding streets, where you'll discover ancient stairs and doorways with stone carvings. The center street, Boulevard de la Repúblique, is shaded on both sides by large plane trees, some of which are centuries old.